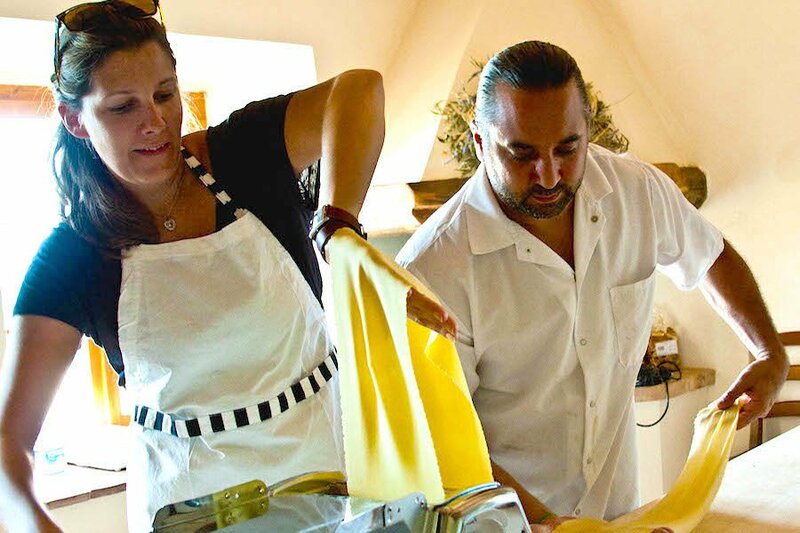 TUSCANY – Marco teaches a student to roll out fresh pasta dough. All photos by Amie Rogosin. Talk about a culinary resume. Marco is currently the chef/owner at and restaurants in New York City and the author of . He grew up cooking alongside his Tuscan-born mother and worked at the legendary Florence restaurant Cibreo before opening the groundbreaking New York City restaurants Craft and Craftbar restaurants with Tom Colicchio. A generous cook with a heart of gold, Marco knows a thing or two about how to create a hearty, authentic, loving feast. We asked him what it's like to cook with him at Villa Montecastello. How did you end up at Villa Montecastello? Jens Schmidt was importing wines at the time, and we held a tasting at Hearth for his selections. We were a new restaurant at that time, and he had heard good things that jived with his belief system. What's the difference between cooking at the villa and cooking at Hearth? Cooking at the villa seems more connected and real. 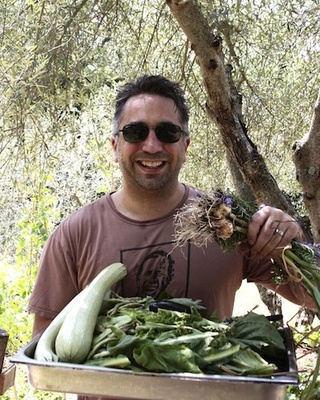 We are often picking ingredients from the garden and using the olive oil grown and processed on the property, as well as salumi and meats from animals raised on the property. Stylistically, the cooking I do at Hearth and Montecastelli are similar, but the context in which I do it couldn't be further away from each other. Are there special challenges when you're teaching in a foreign country? There's never enough ice in Italy!!! What's your favorite dish to teach students? Zucchini frittata is my favorite dish to teach. It is a must for any home cook's repertoire. It must be done in the classic Tuscan style. Meaning, not baked in the oven. The entirety of the cooking must happen on the stovetop and, while a bit anxiety inducing, you've got to do "the flip" in order to cook it through and get proper color on both sides. What's the silly mistake all amateurs make when cooking Italian food? For any kind of cooking, Italian or otherwise, cutting boards that are simply too damn small is a big one. Not understanding salt and how to use it. Not having sharp knives. And specifically for cooking Italian, most home cooks think that Italian food is full of garlic. It's not. You're at the villa to teach, so technically it's not a vacation for you as much as it is for the students. (Unless you're a really mean teacher.) What makes the villa a great place for visitors? The 1,000-year-old, restored villa is a magical place. You rarely, if ever, need to get off the property. It's clean, restorative living, great food, great wine, wonderful people. Your mother and grandmother are from Tuscany. Did you visit often when you were growing up? Practically once a year for quite a while now. My wife and I were married in Italy. Our wedding dinner was cooked by a group of Italian nonnas, and it was amazing! What are your favorite places to go in Tuscany and in Italy? I actually haven't traveled extensively through Italy. I find myself going back to the place I have friends and family in Tuscany, like Lucca, Pisa, Viarreggio, and Florence. Of course we want to know your favorite restaurants — and places to get inspired about food — in Italy. Every year, as a thank you to my "sous chefs" of the cooking class, we go to , a two-star Michelin restaurant in Colli di Val d'Elsa not far from Montecastelli. We sit outside on the patio and tuck into a long, fancy-pants Tuscan meal. is also always a stop when I am in Florence. I have immense respect for Fabbio Picchi, the quintessential crazy Italian chef. is another Florence favorite. What is it about Tuscany — and food, and eating in Tuscany — that makes everyone go so crazy? I can't speak for everyone, but for me it's the simplicity and healthful nature of Tuscan food that I find so attractive. It's clean, good eating that manages to pack an immense amount of flavor and satisfaction to boot. Registration for next summer will be live this fall. Bookmark for info. including airfare and a custom itinerary from Gentedimontagna. Eat (and drink) your heart out. Enter by July 27, 2014. 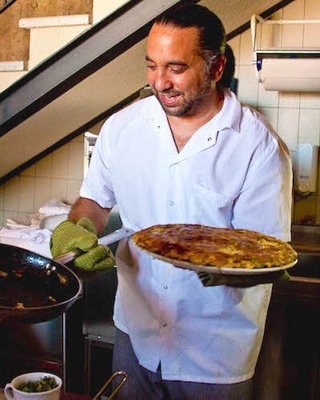 Marco is the chef and co-owner of Hearth restaurant and Terroir wine bars throughout the city. You can follow him at on Twitter.